Country Crafts back issue magazine volume IX, number 4 March April 1994. 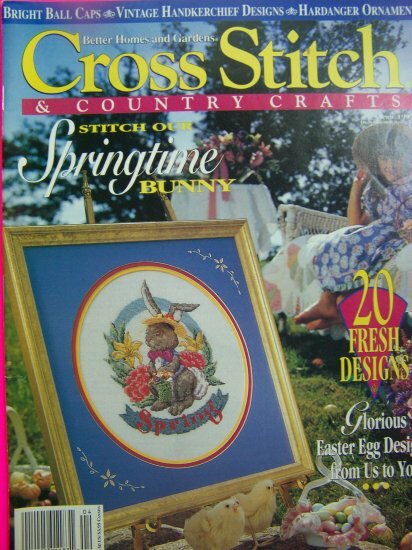 This cross stitch magazine has 39 pages and is 11" x 8 1/2". Contains 20 fresh designs. Cute patterns in the book: Lizzy's Better Homes and Gardens Cross Stitch & Cat, American Beauty rose pillow, Made in the shade ball caps football golf basketball,Springtime bunny Tiny crocheted basket, Wisteria dress, Easter tea linens, Teapot cozy, Apple pie tartlet pan, Peter cottontail sampler, Egg ornaments designs Resurrection, Basket of flowers, victorian floral, Easter sunday, Easter duck, Hardanger ornaments, Hardanger poinsettia, Hardanger poinsettia on white. ~~ Some copies have a mailing label intact while other have been torn off. If you need to see pictures of any of the patterns just ask! More vintage cross stitch back issue magazines, books and patterns listed and more coming..
S & H to the USA : $2.75 and only $1.00 for an additional back issue pattern magazine..
>> Over 10,000 vintage sewing patterns, vintage crocheting, knitting, plastic canvas patterns, vintage fabric, discontinued tapestries in stock!